New high-res map of the Western Lands and updated Perilous Lands V2 book. After many years the server died and everything has moved to a new server. If anything is broken, please let me know. James Claypool has redrawn the Perilous Lands map in great detail. Released the full PDF of the Perilous Lands Version 2. Released the full PDF of P&P Version 2 Rule Book for download. Added the Three Quests for Curses adventure and A Traveller's Guide to Donara. Updated the map for the City of Donara to a higher resolution colour version. Added The Laws of Magic and The Devices of Oom, an article on Illusions by Richard Snider and the C64 code for Computer Character Generation. Added Item destruction and Income rules from TNT, ad Group Motivation rules from Burton. Added new players to the player list. Corrected missing text from questions in more errata and added a couple extra answers from Richard Snider. Added download of HTML version of Book I and new Encounter Charts for PnP V2 monsters. Alchemist skill description by Alex added. Alternative Rules for P&P by Burton added. Economics and Construction by Burton added. Highly automated Excel sheet from Bryan Tllant added. Added an article on making Wands and Staves. Added an article on new Natural Magic Items by Burton. Fixed a mising link for Tower of the Dead from the overview of AH published material. Fixed a missing link to the Site Book from the drop down menu. Added a photo of Richard Snider. Corrected typos in Book I and II (Version 2) spotted by Alex, that were present in the rtf versions only. Added PDF versions of these books as well. Corrected an age that was mistaken for a date in the Marentia section, spotted by Althera. A new high-res map of the Perilous lands is available. Tower of the Dead has been added as well. Next installment: Magic Items descriptions. The first two installments of Scott's ship project finished: Storms and Sea Encounters and Natural Magic Items of the Sea. Extended description for the second alternative gambling system by Burton added. Found the time to update several links. Scott's PBeM site had moved to http://nrgcomputers.com/pbem/ some time ago. Thierry's site to http://meure.be. Three new reviews added to the links page. Minor edits with non-ascii characters in the players list. Added new players and updated contact info. Corrected lands/lands broken links on culture.htm page. The old server (abroere.xs4all.nl) where the site and the mailing list were hosted has died. The website has been moved to a new home (powersandperils.xs4all.nl) and can again be reached at www.powersandperils.org. The mailing list has moved as well and is now at pnp@list.powersandperils.org. Please update any links as needed. Change of location for a group and new players added. Cultural info part and economic table of cultural and economic info added. The first three installments of Scott's Ship Project have been added: Sea Gods, Sea Creatures and Notable Pirates. The last is written by Richard, btw. Burton's ship building toolkit added. Burton's construction and armor and weapon crafting rules added. The portraits from the original article added to the Sea of Tears and Shadow Creatures articles. Added several extra clarifications to Errata page. 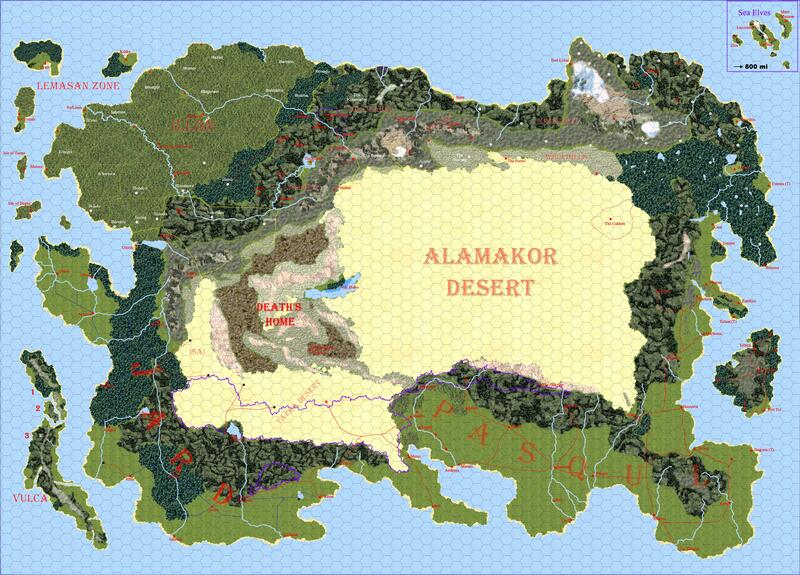 Added a detailed Map of an area between Caldo and Donara and detailed maps of the area around Avalon and Kril Shrandor. Added an alternative wording to the grappling rules by Burton. New character sheet by Scott M, several scans of Heroes uploaded and added to the index. Added the local names of the Western Lands to its description. Added The Creations of Abnaric Elgar. Minor update, added some players to the player list. Book I: The Character Book of the french adaptation of P&P by Thierry has been added on a page of its own. Several business descriptions from Burton as part of the upcoming construction series. A system from Burton to get the traveller off track. Quite pleased with the table. A magic item and spell description from Burton. Also added a new spell and Movement Restrictions due to damage from Alex. New creatures from Burton's hand: Cha'Chak, Ice Troll and Lasali. Also added a revised Armor table. Alternate treasure rules by Burton added. The Player's Guide is a combination of Book I and Book II (version 1.2) in a single PDF. The classic adventure for Powers and Perils, Doom Manor, has been added. The final installment in the Christmas Gift Updates: Goidan and the Story of Jean. Also added a new encounter: the Hunfrithi. Not ten maids a'milking, but a coven of thirteen evil-minded women in the Climan Leaders description. Part two of Richard's Chirstmas Present. Added Alternative Gambling System by Burton from the mailing list. Added new players to the players list. Changed the link to Shannon Appel's Heroes list. Added a detailed map of Hoda Isle and the headwaters of a river on Goidan to the Perilous Lands info. Added Richard's Secret Societies of the Perilous Lands to the site. Formatted the cultural info on Sea and Waterway Travel and Special Ships by Scott. Added Special Sites, Secret Societies and Ten Unique Individuals to the Western Lands. Added Special Sites to Goidan and a note on the Afterlife in the Lands. Formatted Burton's extended equipment list and Scott's extended Random Culture Variation System. Finally formatted and available is Richard's Christmas Present (from last year): The Western Lands. Accompagnying this is the Western Lands Bestiary. Also added the Map of Goidan. After a long, long time there has been an update again. Not much to notice, mostly updated outdated links and corrected typos people noted and were kind enough to email me about. Added a recent labor cost multiplication post to Burton's construction rules. Also added economy section to the Izza. The condensed lists of information from the Culture Book, typed up by Scott, have been formatted and added to the site. Added a long list of spell suggestions posted by Scott Adams. Gives over 100 new spells to select from. Also added Richard Sniders reaction to some of these spells, as well as to the lycanthropy curse. Added random weather generation by Scott. A quick hack to search the mailing list using Google has been added, following a discussion on mailing lists and forums with some valid points made on searchability. Added a list of additional Q&A to the Additional Errata. Added a rule for enchanting shields and size effect. Additions to Bhamotin and the Wallan. A list of locations for rare plants. Added Convocation of Gods to PL Mythology. All resulting from posts to the list over the past few months. A description for Short Bows has been posted to the list, and is added to the combat rules section. Similar for a spear thrower. Added the latest work in progress on P&P v2: Book 1, Book II: Magic section and Book III: Creature stats. The descriptions for Dispersion and Damnation were originally missing from the priestly spell descriptions. They were posted to the p&p mailing list recently. Added TNT's french Excel character sheet to the list of character sheets. Added the Fallen gods to the Perilosu Lands Mythology. Added the desciption of Donara's capital from Heroes. The desciption from the front of the Map Book has been added. This includes the legend to the 26 section maps. Added the first half of the Sea of Tears article to the site. The second half, Storms & Encounters has been available for a long time. Also made some changes to the layout of the site, which will show up in IE only, as workaround for IE bugs. So Great about P&P has been added to the site. An online tool to help the GM keep track of combat priorities, calculate hits and damage and also keep track of events occuring during combat or the adventure in general. Added a description for the long lost spell Sound Sphere to the site, as well as new Armor Repairing rules. Translated TNT's movement tables from french to english. Added a link to the full Perilous Lands map by Floyd Resler, added some more errata/questions from the list and a lethality index rule. Also fixed the entry for the Kameran and Caldo. Added a link to Floyd Resler's online game. The address for the Powers and Perils mailing list address has changed. The archives of the list have moved as well, see the description. Added the detailed description of the gods of the Perilous Lands, posted by Richard Snider as a Christmas present. Added some remarks from Richard Snider on the origin of Goidan and Fomoria. I found a random culture generator made by Scott Adams and put it on a page of its own. Added a few more errata, gathered from several emails sent to the list. Added a revision history page, listing all site updates. Added screenshots of old site to About page. Fixed a couple of broken links, thanks to Andy B. Added a description for Version 5 of the Rule Books, defined as the upcoming draft of P&P v2 by Richard Snider. Added a newly proposed combat option, Fighting Aggresively and a weapon damage house rule. Added the lists of relative Cultural Powers to the Perilous Lands section, as well as a second description for the Sand Claw Cult. The pages for Books I to IV, as well as the Culture Book, now show a scan of the book cover and the short introduction from the beginning of the book. Correction made to Dirllar; moved the Population Detail section down. Same for the Ghazai. Completed the Ashudan Economy section. Added Regis Baya to the Zen'da to the Perilous Lands section and made the maps fully clickable. All the Perilous Lands descriptions are now available. From now on, this site is only available from www.powersandperils.org and no longer from either the dutcgeo.ct.tudelft.nl or the geo.citg.tudelft.nl locations. Anyone who is still using the old locations, please update your links, as I am unsure how much longer these locations will be available as redirectors. Also added Ja'xon, Kakana, Kalem, Kameran, Katai, Kazi, Kirazan, Kll'maun, Kolari, L'p'nth, Lemasa, Mopazi, Nerid, No'mal, Novarask, Nylasa and Omavor. It has been almost a year since the last update. The players list has been updated and descriptions for the Helva, Humagi, Ipanza, Iravoy and Izza have been correctly formatted, and their locations made clickable on the maps. Site overhaul: Index, Background, Players, Worlds & Adventures, Tools and Mailing List sections have been updated. Rules and Perilous Lands will follow.